Eighty-five feet above the Lake Michigan shoreline a former NFL player's new home amplifies the functional details for a confident design statement. Five bedrooms accommodate the grown children who visit their parents at this new South Haven, Michigan residence with soaring wing-like roofline and arresting views of forest and water. Architect Robert J. Neylan designed the home for a former player on the St. Louis Cardinals and his wife, positioning the open plan kitchen to directly face the majestic lake view outside the great room's full-height glass walls. "It's the 'anti-integrated' kitchen," explains Neylan. "This house was so muscular and expressive, I thought the kitchen needed to have the same conviction and really express its parts, so they're all oversize and freestanding." From the freestanding stone fireplace to the warm cedar ceiling, every detail speaks for itself. 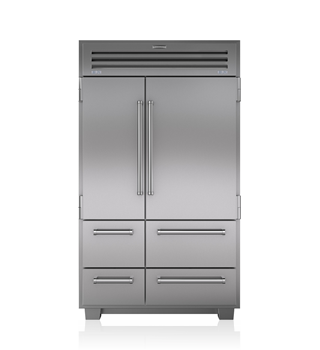 Refrigeration could have been integrated into the paneling, but instead Neylan chose the PRO 48 with solid stainless front to boldly proclaim its function. Neylan likes its clarity of purpose. Likewise, he eschewed the minimalist approach of recessing the sink into the countertop, instead raising the box above the flame-finished Atlantic blue granite countertop to stand out loud and proud. 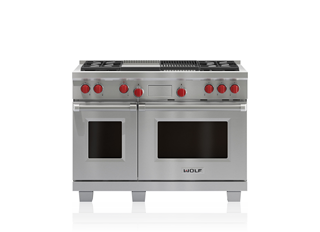 "The flamed and wire-brushed countertop is beautiful and easy to live with," Neylan adds. "It doesn't show fingerprints or water spots." At one end of the cooking island with Wolf range and griddle popular for big family breakfasts, is a massive block of maple. The freestanding cube has a wine rack on one side, backlit to highlight the storage utility. Extending partway across the maple is a great slab of dark countertop that creates separation but also visually anchors the entire room. Even the exhaust hood was exploded out to ten feet across, creating an architectural element with task lighting that spans the entire island. "It's a transparent kitchen that exerts itself by being muscular," Neylan concludes. "It's all a balance of those two things."